A group of disparate explorers settle in a bountiful alien land. Through technology they transform the world, making it beautiful, hospitable, profitable. And little by little, they doom themselves. The Worst Hard Time: The Untold Story of Those Who Survived the Great American Dust Bowl, by Timothy Egan, is a sweeping, epic portrait of the rise and fall of not just a civilization, but a world. It shows us that the line from the T. S. Eliot poem, “This is the way the world ends. Not with a bang but with a whimper,” is true. And that whimper gets drawn out for quite some time. The book begins by giving us a tour of a community currently on the Oklahoma panhandle. It’s slowly creepy towards ghost town status. All of its inhabitants are elderly or leaving. It’s hot, it’s dry, it has a kind of sterility to it. So far, that’s exactly what we expect when we hear about the region, which, admittedly, most of us learn about from film strips about the Great Depression. We then go back to the time of the not-quite-pioneers. People from “back East” who in the early 1900s, were swindled into moving into a “town” that didn’t exist yet, and found themselves sitting on a gold mine. The soil was the richest stuff that anyone had ever seen. Water was scarce, but soon farmers discovered abundant water under the ground. At first, the settlements were just prosperous farming towns in which people built swimming pools and mansions and fruit tree groves and stately parks, re-engineering the landscape. When World War I started, and the price of wheat went sky high, everyone got rich off that dirt. All of this is just the first part of the book. We get a brief flicker of foreshadowing when we see the down side of abundance. The more you produce, the lower the price gets, and the more you have to produce just to get by. The farmers, who took out loans to buy land, do just that. Then the ecological disaster begins. The rest of the book is just relentless. 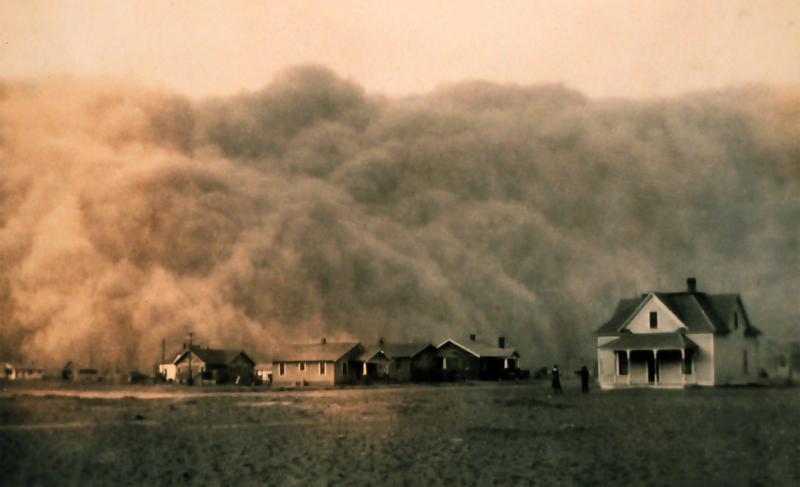 Today we know about dust storms during the Dust Bowl. At the time, no one knew they could exist, and so citizens in town watch in shock as mountain-high clouds of dust blanket their town, short out their cars, bury their fields, kill their cattle, and fill their lungs with grit. It happens again, and again. Rain is nonexistent. The dirt fills with spiders and insects. Everything else dies. Through it all the citizens of these towns live in a kind of perpetual shock, always thinking that this has to have been the worst of it, and it can’t possibly be as bad next year. We know that it was as bad next year—that it never really recovered. The only thing we got out of it was a much better understanding of how to manage land. Early environmentalists, we learn, weren’t hippies. They were hardworking farmers who had learned how entire states can be destroyed if one group of people don’t use the land the right way. The problem wasn’t just the determined farmers who plowed up the soil in an effort to plant more and more wheat. It was the farmers who gave up, or were driven away, and left the crops on their soil to shrivel up and blow away, quickly to be followed by the topsoil. If farmers had left the abandoned plots alone from the start, used a smaller proportion of the land, or had planted native plants in place of the grain they were growing, this disaster could have been prevented, but they didn’t know that at the time. Now we have more of an understanding of the soil as a working part of the landscape, instead of simply a ground on which to stand and to plant. We’ve also come around to the idea that ecology has to be a society-wide, planned effort. Individuals working their own ground in their own way just won’t do, because get into the wrong cycle and those individuals can wipe out whole states. The story in The Worst Hard Time could easily be transplanted to a novel set in an alien world, and it has the scope of a trilogy—but it’s also personal. It focuses on specific people, letting us watch as people do things they swore they’d never do, build up their dreams only to watch them get snuffed out, and fight, futilely, against the collapse of their entire world.